The following article by Gerry Adams (for Leargas) was written in advance of Wednesday’s meeting between Martin McGuinness and the queen. The peace process has seen some strange and unexpected and remarkable developments in its almost 20 years. Sinn Féin leaders in Downing St and the White House; US Presidents shaking hands with Sinn Féin leaders; unionist leaders, who wouldn’t sit in the same television studios or talk to us in the negotiations, now sitting in an Executive and all-Ireland Ministerial Council; and Martin McGuinness and Ian Paisley demonstrating that former enemies can be friends. And that work being continued by Martin and Peter Robinson. There has been much more. It is evidence of the success of the process in achieving change. Of course, it doesn’t mean that unionists are now republicans and prepared to agree to a united Ireland or that republicans have become unionists. And there are still many issues of difference and concern between us. But we have a process, rooted in equality, which has the capacity to resolve these with patience. This week will see another historic moment. Martin McGuinness has received an invitation from Co-operation Ireland to attend an event in Belfast next week – unconnected to the Jubilee - to celebrate the arts and culture across Ireland. The event will also be attended by the President of Ireland, the Queen of England and by First Minister Peter Robinson. 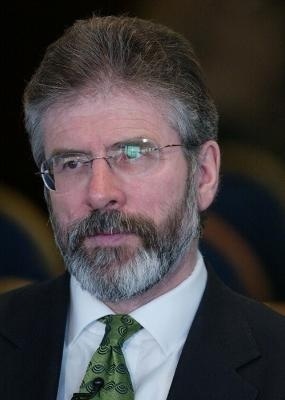 Last Friday the Sinn Féin Ard Comhairle agreed that Martin could accept the invitation. This is a significant initiative involving major political and symbolic challenges for Irish republicans. As the record of the peace process demonstrates Irish republicans have frequently been prepared to take bold and historic initiatives and risks for peace to break stalemates and find agreements. We do so as activists whose primary political objective is the re-unification and independence of Ireland, and we have a coherent and viable strategy to achieve this. Key to uniting Ireland is our ability to persuade a section of unionists that this is the right decision for them. To make it work it has to be part of a genuine process of national reconciliation and transformation. I understand that a meeting between a Sinn Fein leader and the Queen of England is difficult for some republicans and for the victims of British state violence, even if the President of Ireland and the First Minister Peter Robinson is present and they are all participating as equals. The Irish republican and nationalist experience with the British monarchy and the British state over centuries has been tragic and difficult and the vexed and unresolved issue of sovereignty remains paramount. But Irish republicanism is rooted in the ethos and philosophy of Wolfe Tone and the United Irish Society, who sought the unity of Catholics, Protestants and dissenters. We are about the work of building a new republic, a new Ireland. And that means demonstrating to our unionist neighbours that we are serious about creating a society on this island that they will be comfortable in. The British Queen has a unique place in the hearts and minds and sentiments of the unionists. As republicans we reject the idea of royalty or monarchy or elites or hierarchies but unionists have a different perspective. We have to understand that if our conversations are to have relevance and make sense to them. Last year, Queen Elizabeth II visited Dublin. Sinn Féin declined to participate. That was exactly the right decision. That visit marked a rapprochement in relations between that state and the British monarchy. That was a good thing. It took 100 years to achieve. In the course of her visit she made some important gestures and remarks, including an acknowledgement of the pain of all victims, which demonstrated the beginning of a new understanding and acceptance of the realities of past. I welcomed that at the time and said it should be built upon. This is a different visit — in a different context. This week’s meeting is a clear expression of the determination of Irish republicans to engage with our unionist neighbours and to demonstrate that we are prepared, once again to go beyond rhetoric, as we seek to persuade them that our new Ireland will not be a cold house for unionists or any other section of our people. Unionists don’t need me to tell them that they have lived on this island for centuries. This is their home. It is where they belong and it is where they will remain. Our Protestant neighbours also have a proud history of progressive and radical thinking. The founders of Irish republicanism where mainly Protestant. They were for the emancipation of their Catholic neighbours and for equality. Republicans are democrats and the new republic we seek is pluralist. An Ireland of equals in which there is space for all opinions and identities. Sinn Féin is for a new dispensation in which a citizen can be Irish and unionist. Where one can also claim Britishness and be comfortable on this island. Our vision of a new Republic is one in which, in Tone’s words, Orange and Green unite in a cordial union. The Sinn Féin decision reflects a confident, dynamic, forward-looking Sinn Féin demonstrating our genuine desire to embrace our unionist neighbours. It also reflects the equality and parity of esteem arrangements that are now in place. It will also create new platforms and open up a new phase in our relationships and will be another important and necessary step on our collective journey. It is clear that legacy issues have to be dealt with and Sinn Féin will continue to engage in that work. By our actions Irish republicans will be judged, as well as our beliefs. We have to change Irish society now, North and South, to accommodate the unionist population and their cultural identity. The meeting between Martin McGuinness and the Queen of England will assist in that process. If the peace process has taught us anything, it is that the process cannot remain static. It must continue to expand and we must constantly build on the progress that has been made.